Provide feedback, and get help with any problem you may encounter. Contact Couchbase Support: If you are a customer of Couchbase Server Enterprise Edition, and have a support contract, you can log into the Couchbase Customer Support Portal, and so make contact with Couchbase staff-members, who will provide guidance and assist with any problems you are encountering. Email and phone support are also available. Participate in a Forum: Multiple online forums are available, whereby you can post a question, and get answers; both from Couchbase employees and from members of the Couchbase community of developers and administrators. Submit a ticket: Couchbase lets you use JIRA software, to report issues as individual tickets. Submit documentation changes: If you find errors in Couchbase documentation, you can make your own edits to the source; and directly submit your changes to the Couchbase documentation team. 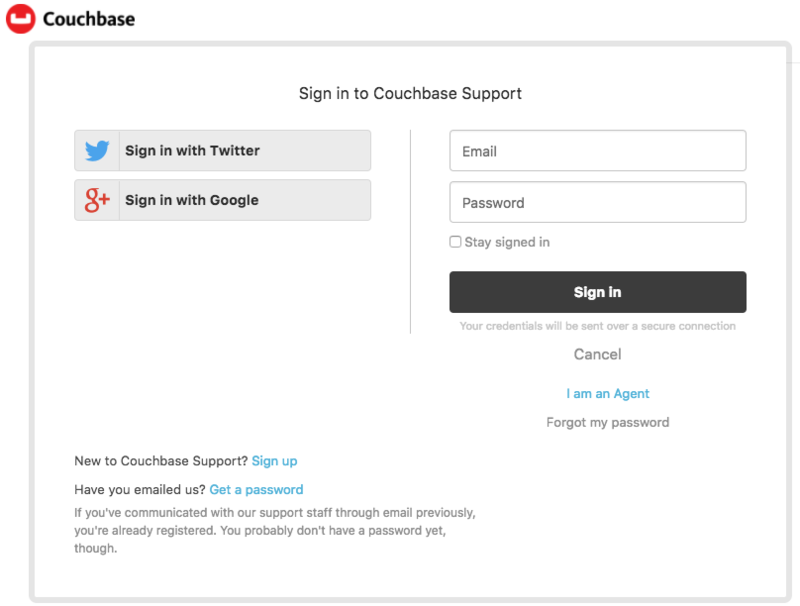 You can also contact Couchbase Support by phoning +1-650-417-7500, or by sending email to support@couchbase.com. To participate fully, you need to register: left-click on the Sign Up button, at the upper right. Then, to access individual forums, select from the all categories pull-down menu. A description of your environment (package installation, build number, operating system, etc). All steps required to reproduce the issue. This should include all relevant expression-names, parameters, flags, and values; with sample output in verbose mode from repeated executions, using different values. Query-results from the command-line, when failures have occurred through use of the UI; and vice versa. This allows you to open a pull request, which will be reviewed by Couchbase staff-members, prior to integration of your submitted changes into the documentation-set.